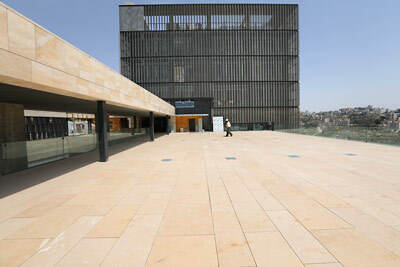 The new building of The A.M. Qattan Foundation, situated in the al-Tira neighbourhood in Ramallah, a few hundred metres from Nelson Mandela square, is an embodiment of the Foundation's commitment to innovation and excellence in content and form. Designed by Seville-based architects, Donaire Arquitectos, the building’s dominant feature is a cube of sleek louvres which emits light at night, acting as a metaphor for a lighthouse, thereby underpinning the Foundation’s aspirations for the building to become a beacon of knowledge and science, a haven for cultural exchange, and an incubator for creativity. 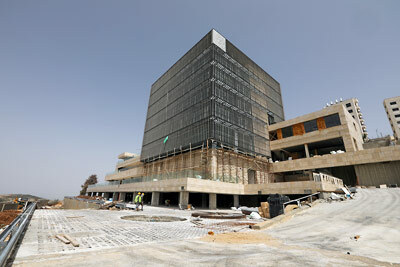 In addition to work offices, the A.M. Qattan building will house state-of-the-art public facilities that will host the Foundation’s events and activities and those of collectives, individuals and organisations who may wish to use them. 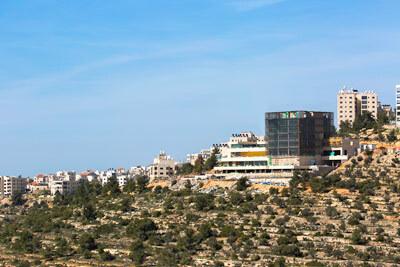 It is the first building in Palestine to be registered with the Palestinian Higher Green Building Council. Our library, which occupies two floors, offers a significant collection of books, periodicals, film and databases specialising in the Foundation’s areas of work. The Library is the perfect place for individual reading and work as well as group work. There are two group workrooms available for reservation and one room for children’s activities, along with work desks and a lounge-like seating area. This 270m2 hall can seat 200 guests and can also be divided into three equal spaces. The hall is fitted with soundproof partitions, blinds and audio-visual equipment to suit workshops, lectures, conferences, seminars and meetings. It also has direct access to an outdoor terrace, garden and lobby that can all be used during functions. A 410m2 exhibition space designed with the highest technical standards and programmed to host different types of art exhibitions. The exhibition space is flexible and can accommodate several smaller exhibitions. It is equipped to cater to different exhibition needs in terms of environment, lighting, partitioning, etc. An intimate, well-designed space with retractable seating, a drop-down screen and control room. This space caters to around 120 people and can be used to host talks, music, theatre, and cinema shows or as a training and rehearsal studio for dance and theatre companies. A classroom that is open for experimentation, exploration and innovation in modern educational practices. Equipped with the needed tools and equipment, this space offers researchers, artists, and educators the place to work with teachers and schoolchildren to create and test their own experiences. The Foundation has incorporated a two-room residence space in its new building. Each room has its own bathroom and can host one or two individuals; the two rooms share a common living space and kitchen. With an independent entrance, the residence opens to a garden. The space is scheduled to host local and international guests through seasonal residency calls. Situated on the main terrace of the building with a wonderful view of the surrounding hills, the Restaurant is a mash-up of social, cultural and gastronomic experiences for our audiences and visitors to enjoy. 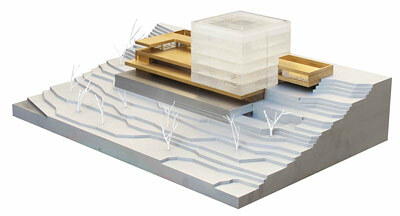 The gardens are divided into two zones: the courtyards and the external landscape terraces. The sources of inspiration in the design of the courtyard spaces are the Palestinian urban gardens of the early 20th century. Palestine has a rich urban history to draw upon in domestic architecture, urban gardens and urban dwellings. The courtyard gardens celebrate the tradition of garden building for leisure and enjoyment and reference a specific aesthetic sensibility developed in Palestinian dwellings, particularly in the early 20th century. The gardens are characterised by the use of productive and ornamental plants in addition to aromatic varieties of vegetation, that resonate with the cultural and artistic psyche of the people of Palestine and the region such as jasmine (yasmin), Arabian jasmine (fil) and roses (ward). Furthermore, the much-loved vine trellis in our old building in Ramallah, was replicated in our entrance courtyard to continue the tradition of conversation and ideation under the vines. 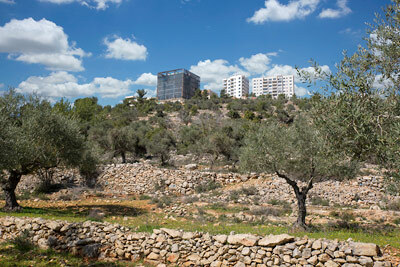 The landscape recalls the traditional agricultural terraces and olive orchards of Palestine. 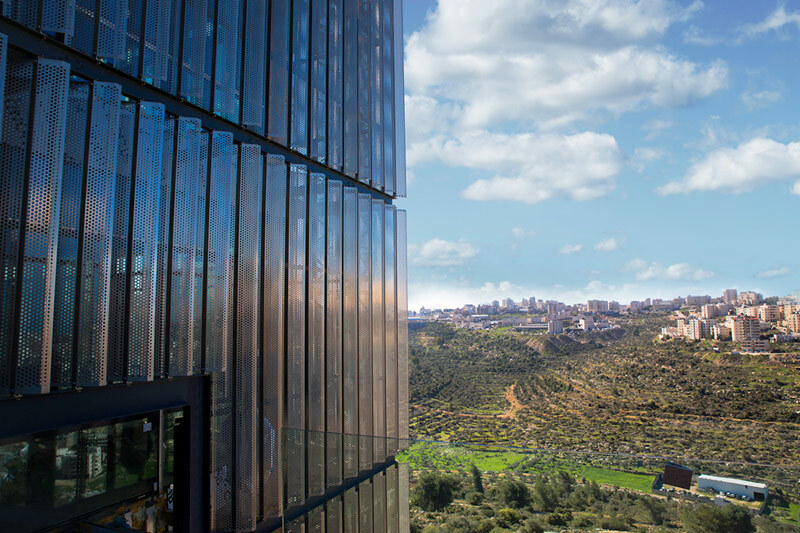 A collection of olives, native trees and aromatic plants populate the terraces and slopes; some of trees that were removed from the site during construction have been replanted around the building. From press information. © Images: Donaire Arquitectos. © Photos: Ahed Izhiman, Courtesy of A.M. Qattan Foundation.